Located close to the Metro and the local party area of “LA 70”, The Wandering Paisa offers the most authentic cultural experience in Medellin. We seek to immerse travelers in the local Paisa culture while providing them with a safe and comfortable place to stay with local activities and events. **love sports? ** we now have a sports package, featuring ALL Champions League, NBA, NFL , NHL, MLS , MMA/UFC and other professional sports games. PAY PER VIEW INCLUDED. 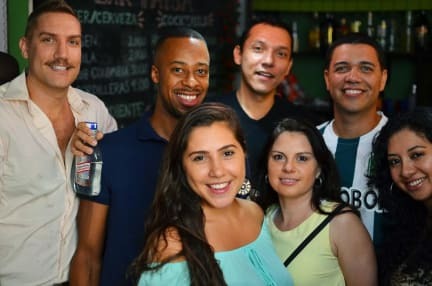 We are located in the upscale neighborhood of Laureles, a block from the local hotspots of La Setenta and La 33, where prices are affordable, the locals are plenty and the bar/club scene is vibrant. We also are less than 5 minutes walking from the Metro system, which can bring you virtually anywhere in the city. Our knowledgeable and bilingual staff will be more than happy to provide you with any information on tourist activities in Medellin and the surrounding areas as well as make bookings for tourist activities and airport pickups. Decorated with a bohemian theme that pays tribute to South American and Colombian culture, our hostel boasts some of the best services in town. With 4 dorms (no larger than 8 beds each) and 3 privates, every room in our hostel has its own unique country theme, each hand painted by local art students. In our rooms, we have the best bunks in Medellin, designed with privacy dividers, orthopedic mattresses, and a locker for storage under the bed. Most importantly, these beds are not the kind that squeak or move when you climb up, allowing you to sleep comfortably in peace and quiet. We also have six fully remodeled bathrooms, with 24-hour hot water and brand-new computer workstations. Inside the hostel, travelers can relax and play Nintendo Wii on our 42-inch plasma screen T.V. equipped with cable television and a large selection of DVDs. For stunning views of the surrounding mountains, travelers can climb to the top of our castle-like terrace located on the roof of the building. If you are feeling social, you can kick it in our 'Paisa Bar' which serves both nonalcoholic and alcoholic beverages. This is a great hostel to meet other travelers. The common spaces are very nice for relaxing. The staff is very accommodating and will help you with whatever you need. Seriously the best staff of any hostel in South America so far. Absolutely above and beyond helping me out with the city. It's in a fantastic neighborhood that is safe but not super tourist like Poblado. Language exchange night was crazy fun too! Great hostel For people who don’t want to stay in a party hostel in the tourist neighborhood. Chill atmosphere in a nice neighborhood among locals. Great hostel in a good location on LA 70. 5 min walk to the metro. I met a bunch of cool people from all over the world. Lots of solo travellers and common areas to meet people. Bathrooms and dorm rooms were clean and tidy. Staff shut down anyone talking in the common areas at midnight (or 1am on weekends) which was good for those wanting to get sleep. For those who want to go out local bars are right around the corner or El Poblado is a 12mil taxi ride away (or a few stops on the metro). Staff were nice & very helpful. Room was kinda dingy and dark. Smoker’s balcony was half on the hallway and half outside my room so I could hear every word of every conversation and also smell the smoke as we had to keep the window open due to no air con and no working fan. Beds were super squeaky and loud, girl above me even apologised for that, bless her... Lots going on for those who like a social/party hostels. Lots of areas to chill too. Our en-suite bathroom was clean too.